With every battered line, scrape and knock, each coin has been rendered as individual as the many thousands of hands they have passed through. 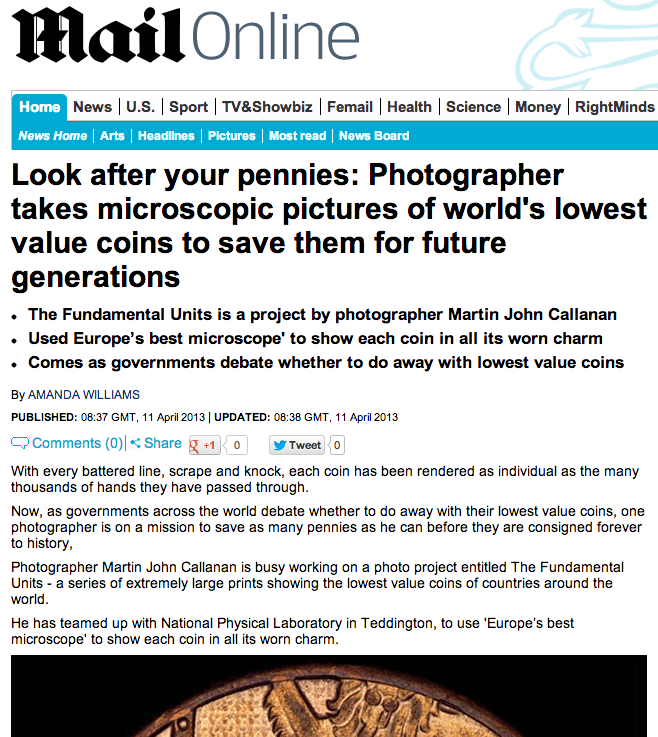 Photographer Martin John Callanan is busy working on a photo project entitled The Fundamental Units – a series of extremely large prints showing the lowest value coins of countries around the world. He has teamed up with National Physical Laboratory in Teddington, to use ‘Europe’s best microscope’ to show each coin in all its worn charm. Each coin is photographed with 4,000 individual tiny exposures, and it takes three days of processing to turn the individual photos into a single composite photograph weighing 400 megapixels. Printed out, each photo measures 1.2 and 1.2 meters (~3.9 square feet). ‘In this sense, and in response to the dominance of macroeconomics in the discourse of the media, the artist chooses a microscopic view of the world economy. ‘The images obtained with the microscope have been combined to form an extremely detailed large scale reproduction of the least valuable coins from Australia, Chile, the Euro, Myanmar and the Kingdom of Swaziland. There are many precedents for scrapping small coins. In America, the half-cent was abolished in 1857, and in 1984 the UK’s halfpenny was withdrawn. New Zealand and Australia abandoned the one-cent and two-cent coin in the 1990s. Campaigners in the US and UK also want the penny and cent coins to be consigned to history, because nothing can be bought with a one-cent or one-penny coin.